It was the final that everyone wanted – the Champions of England and current European Cup holders versus the Champions of Italy and holders of the UEFA Cup Winners’ Cup. Liverpool and Juventus were two teams at the height of their powers with international players in every position. A mouth-watering display of footballing talent was keenly anticipated by a TV audience of tens of millions across Europe. What they got instead was a slowly unfolding tragedy which formed a terrible backdrop to an increasingly irrelevant game of football. 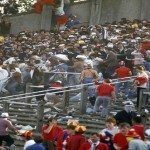 The name of the host stadium, Heysel, in Belgium, has since become a watchword for hooliganism, official incompetence and structural neglect. The match was treated like any other big final. Tickets were allocated to the two sets of fans and they were to be separated by a neutral enclosure. Officials from both clubs had warned that many, mainly Belgians, in the neutral section were likely to sell their tickets, at a price, to partisan fans. There was a history of violence between English and Italian clubs and the previous year’s final in Rome had ended in acrimony when Liverpool beat the local side Roma on penalties. Roma fans, the police and local hoteliers had all turned on Liverpool fans, who were forced to seek refuge in the British embassy. Heysel was Liverpool supporters’ chance for revenge. The neutral section quickly filled with mainly Italian fans and all that separated them from the Liverpool section was a flimsy fence. Taunts started and then missiles began to fly. 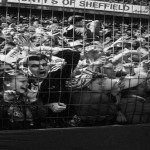 The fence was quickly breached and the Liverpool fans advanced. Panic erupted as Juventus supporters tried to retreat, only to find their way blocked by a concrete wall. The pressure proved too much and the structure gave way, crushing the trapped Italian fans. What was the Heysel Stadium Disaster death toll: 39 killed (38 Italians and one Belgian); 400 injured. You should know: Heysel Stadium was built In the 1920s and was clearly not suitable for such an occasion. It had failed inspections and the threat of closure hung over it. Because of this, little was spent on maintenance. Local police had embarked on a policy of getting unruly fans into the stadium early rather than arresting them. All of these factors contributed to the tragedy. By the spring of 1985 Bradford City looked like a football club that was finally going places. The ‘Bantams’, as they are affectionately known, had just secured promotion to the old second division when in early May the club hosted a match with Lincoln City. A bumper crowd of over 11,000 turned up to celebrate. The match failed to live up to the occasion and as half-time approached neither team appeared to be threatening to score. It was at this point that people in the antiquated wooden main stand began to notice a bright shimmering light coming from below. Others began to feel warmth under their feet. Within a few minutes flames were clearly visible and police and stewards began evacuating the packed stand. The combination of an old wooden structure and accumulated litter that had been allowed to collect beneath the stand acted like a tinder box. Within five minutes the fire had spread to the roof, sending ash, burning embers and choking smoke onto the spectators below. One side of the ground turned into a raging inferno and those who had not yet escaped were in serious danger. Although over 50 people lost their lives and many more were injured, the figure might have been much higher had it not been for the bravery of some spectators and the police on duty that day. Many risked life, and limb to return to the heart of the fire and haul out the injured. Afterwards 22 spectators were given awards for bravery. A subsequent investigation concluded that the fire was probably caused by a discarded cigarette end or a match. An inquiry chaired by High Court Judge Sir Oliver Popplewell reported a year later and recommended an overhaul of safety at all British sports grounds. You should know: A council report just a year before the disaster proved tragically prescient. It warned that the build-up of litter was a possible risk, even stating that It could be ignited by a dropped cigarette. The club had no legal obligation to heed the council’s warning and the rubbish was not cleared away. The last 32 UEFA cup match between Spartak Moscow and Haarlem was hardly one to capture the imagination of the football-loving public. Though Haarlem had enjoyed their most successful season to date after finishing fourth in the Dutch league, they had been forced to sell their top player, Ruud Gullit. Spartak themselves could not boast any great talent either and only around 100 Dutch fans bothered to make the trip to Moscow. The Moscow public was also decidedly lukewarm about the fixture and few bought tickets to brave the cold early winter air. Faced with such a meagre attendance, the authorities made the fateful decision to close off most of the ground and hem the 15,000-strong crowd into one stand. The match did little to warm the hands of the assembled audience, save for a Spartak goal in the 17th minute from their star striker Gess. It was a lead that they held onto until the game went into injury time. Satisfied with their team’s work and keen to get back to the warmth of their homes, the crowd began to leave. Just seconds before the final whistle was due to be blown, Sergei Shvetsov doubled the home side’s lead and put the game beyond doubt. Hearing a roar, many in the departing crowd turned round and headed back to investigate its cause. The military police, who routinely managed sports events, were concerned only with blocking the returning fans, rather than opening more gates to ease a growing bottleneck. With underfoot conditions becoming ever icier, many began to slip and slide and this sparked a stampede. Hundreds of people lost their footing and hundreds more had no escape other than to clamber over the fallen. Scores were trampled to death and many more suffered severe injuries. 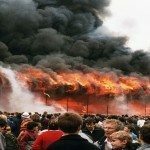 What was the Lenin Stadium Disaster death toll: Official records put the death toll at 67 but the true figure may have run into hundreds. 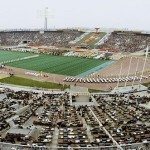 You should know: Such was the secrecy in the former Soviet Union that, in spite of the presence of several journalists in the stadium, little was reported in the press. A local Moscow newspaper carried a small article stating merely that there had been an incident at the game and that some people had been injured. The Dutch team did not learn of the tragedy until many years later, and on the 25th anniversary of the disaster the original teams played a benefit match in aid of the victims’ families. Named after George Karaiskakis, a hero in the 19th century Greek War of Independence, the Karaiskakis Stadium was the velodrome at the inaugural 1896 Summer Olympics in Athens. This venerable venue became the home of soccer outfit Olympiacos FC, the most successful club in Greece. However, two other great teams in the Greek capital – Panathinaikos and AEK Athens – are also constantly vying for supremacy. 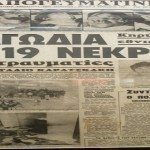 Derby matches between Olympiacos and its big-city rivals are eagerly anticipated by supporters, and so it was in February 1981 when two sets of passionate fans packed into the Karaiskakis Stadium for the big game between Olympiacos and AEK Athens. In the event, the home side enjoyed a mighty triumph, beating arch rivals AEK 6-0. This was a cause for ecstatic celebration among the home contingent, but euphoria soon evaporated when disaster struck. After the final whistle, excited Olympiacos fans made a rush for the exits to continue their victory party outside the ground. At Gate 7 a partially closed exit was the cause of the biggest tragedy in Greek football history. Fans on the bottom steps hesitated and were pushed over by the solid mass pressing from behind. Dozens went down and were engulfed as the crowd continued to surge forward. When the melee was finally sorted out, 19 supporters had lost their lives and many more were injured. Most were young adults or teenagers. The passion that Greek football fans bring to the game was matched by the intense sorrow with which they have mourned its victims since 1981. Every year on the anniversary of the catastrophic crush, thousands gather inside Karaiskakis Stadium for a memorial service, at which the massed fans sing the moving refrain ‘Brothers, you still live and you are the ones who guide us’. What was the Karaiskakis Stadium Disaster death toll: 21 (including two victims who subsequently died in hospital). Over 50 were seriously injured. You should know: The Karaiskakis Stadium was rebuilt as a state-of-the-art venue to host the football competition at the 2004 Summer Olympics. But the Gate 7 tribute area has black seats among the standard red of Olympiacos, forming a giant figure 7, and there is a monument on the eastern side of the ground bearing the names of all 21 victims – gone but not forgotten. 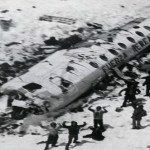 It is usual to describe the survivors of accidents as ‘lucky’, but in the case of the ill-fated Uruguayan college rugby team, stranded in the High Andes after a plane crash, luck had nothing to do with it – only the team’s sporting spirit of co-operation and endurance ensured that any of them made it back alive. On October 12 1972, a plane carrying Stella Maris College rugby team plus coaches and supporters took off from Montevideo. The team had an inter-college match fixture in Santiago, Chile. Bad weather forced an unscheduled landing in Mendoza, Argentina. After an overnight stop, the flight resumed but the terrible weather still hampered progress. The pilot plotted a new route across the mountains into Chile but he miscalculated the aircraft speed and sent an inaccurate location report. Suddenly a blanket of cloud engulfed the plane and it crashed into the snow-covered mountainside; 17 passengers and crew were either killed instantly or died within minutes. The survivors were in the main extremely fit young men, but they were stranded on a barren snow-covered rock face miles from anywhere in freezing conditions, with scarcely any food and no shelter apart from the plane’s mangled fuselage. They huddled in the wreck of the plane and awaited rescue. By the tenth day, two more had died of their injuries and the rest were starving. An avalanche killed another eight. The life-or-death situation demanded an extreme response. The remains of the team had to make an appalling decision: the only way to stay alive was to eat the flesh of their dead friends. After 60 days the two fittest youths, having regained some strength, set off on a 12-day trek through the mountains and finally found help. Of the 45 people on the flight, 16 survived their horrendous ordeal. You should know: Robert Canessa, a medical student, is thought to have proposed cannibalism as a survival strategy. He was later to make an unsuccessful bid to become president of Uruguay. The ordeal of the plane crash and its aftermath was recounted by author Piers Paul Read in his best-selling book Alive!, later made into a film.